Embark on our 2016 Provence Wine Study Tour with professional-level instruction on site coupled with a wine certificate program! This unique wine tour will give you access to exclusive wine estates allowing you to study and taste delicious local wines under the instruction of a local Master of Wine. Provence is one of France’s most beautiful and enchanting regions. It also is one of its oldest wine producing regions, famous today for its refreshing and seductive rosés. Exceptional reds and flavorful whites are also produced in Provence. It is a fragrant region where garrigue-infused sunshine and Mediterranean sea breezes are revealed in the wines. Embark on your Provence wine tour and visit the top wine estates. Explore the varied terroirs and appellations and discover the multitude of wine styles produced in this sunny and picturesque wine region. Travel to Provence with Elizabeth Gabay, Masters of Wine and Provence expert and resident since 2002. 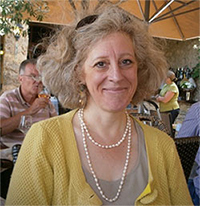 Elizabeth has written about Provence wines for Decanter magazine and has led master classes on the subject. She regularly lectures at international wine conferences and is a wine judge at numerous wine competitions including Decanter’s World Wine Awards. Visit the best wine estates of the Côtes de Provence…the ones that put rosé wines on the map and showed that they can indeed be remarkable, complex and serious wines. Tour the Bandol wine appellation and taste the deep and powerful reds that are considered one of the top wines of France. Study this privileged terroir where the Mourvèdre grape and expert winemakers play starring roles in creating truly exceptional wines. Visit the stunning fishing village of Cassis known for its famous vine-covered cliffs that tower over beautiful inlets of aqua-blue sea. Discover Cassis’s white wines and enjoy them perfectly matched with delicious local fresh fish. Savor the exceptional gastronomy of Provence, including specialties such as bouillabaisse, daube Provencal and fresh grilled fish, dishes that pair exquisitely well with the local wines. Travel to Provence with serious students of wine, either dedicated wine lovers or wine professionals. Share an educational and memorable travel experience while becoming an expert on the wines of this most delightful region. I thought everything was very well planned out. We saw an incredible amount in a short period of time. The visits were all spectacular"
The trip was thoroughly enjoyable and very educational due to an excellent instructor, good organization, a well-chosen list of diverse wineries chosen with many interest- ing characters hosting us at each one"
Liz Gabay was the perfect instructor for the trip: a Master of Wine living and specializing in Provence! She is warm, friendly and always provided valuable insights on our visits"
Participants arrive independently to Nice at the Hotel le Flore near the famous Promenade des Anglais. Dine on your own in town with our recommendations. Visit AOP Bellet, a tiny appellation within Nice, at top producers Chateau de Cremat (where you’ll see their Roman cellars) and Chateau de Bellet. Enjoy a Niçoise-style lunch nearby on the lovely terrace of Auberge du Rédier. Drive through the scenic Esterel hills to the small appellation of Cotes de Provence-Frejus for a visit and wine tasting at Domaine des Planes, including their rosé made from the Tibouren grape variety. Check in to the 4-star Best Western Hotel La Marina on the Mediterranean coast at Saint-Raphael. Enjoy a welcome dinner of Provençale specialties at a fine restaurant in Saint Raphael. At Château d’Esclans, enjoy a vertical tasting of their famous rosé “Garrus” and their other fine rosés. Lunch at Chateau Mentone will include produce from their own garden accompanied by a vertical tasting of their red wines back to 2006. Enjoy an exclusive wine tasting at one of the oldest and best-known estates in Provence, Domaine Ott. Return to Saint Raphael for an evening on your own to explore this charming seaside village and try one of its fine restaurants. Discover the modern face of winemaking in Provence today, starting with the great cooperative Comptoir des Vins de Flassan. Join the winemakers of Chateau de Chabert, Domaine du Grand Cros and Domaine Mirabeau for a wine tasting and lunch, as they present their wines and discuss what’s it’s been like to be outsiders in this very traditional region. Visit renowned estate Clos Cibonne, the only estate allowed to produce an appellation wine made completely from the Tibouren grape - these rosés have an amazing ability to age! Check in to 4-star Hotel Kyriad Prestige in the port town of La Seyne-sur-Mer on the Bay of Toulon. Enjoy time on your own tonight to explore the village of La Seyne with our restaurant suggestions. Spend the day exploring the great, age-worthy red wines of Bandol, starting with renowned estate Domaine Tempier. Visit and enjoy a wine tasting at another renowned Bandol estate, Chateau de Pibarnon. Lunch at a fine restaurant in the beautiful back-country of Bandol. Visit another great Bandol producer (TBD) before returning to La Seyne-sur-Mer. Enjoy a delicious gourmet dinner at Bistronomique in La Seyne. To round out the wine trip, you’ll enjoy a gastronomic lunch overlooking the Mediterranean Sea at Michelin 2-star La Villa Madie, and taste how Cassis whites marry perfectly with local seafood. Transfer after lunch to Marseilles train station and airport, arriving late afternoon. **Please note that these are examples of the caliber of maisons and producers to be visited on this trip. Actual Domaines and Producers to be visited on the 2016 trip will be added as we confirm them, and a final updated itinerary will be sent to the students several weeks before the beginning of the trip. ***The Enrolled Student Price applies to those currently studying in the Provence Master-Level program or who have completed it. Full registration in the Provence Master-Level program means students who have previously ordered the Provence Master-Level study manual, exam registration and online study program. Elizabeth introduces herself as your guide before presenting the highlights of the trip: producer visits, lunches and dinners at gastronomic restaurants, accommodation at charming hotels and tours of the renowned landscapes and terroirs of Provence. Provence has attracted many who have looked at life through rosé-colored glasses…Picasso, Cézanne, Van Gogh, Gauguin, Signac, Matisse, Braque, Derain, Dufy. There is something about the light or the sheer lightness of being in this region of France! This unique Provence wine tour allows you to study this exquisite wine region. The Provence wine region thrives on the famous rose, but the climate allows for very interesting and complex white and red wines. The wine study tour will take a look at the exciting wine making that can be discovered in this area. We will visit Chateau d’Esclan, famous for the most expensive rose, where, in 2006 Sacha Lichine changed the Provencal rosé scene forever by showing that its pink wine could be raised to the level of a serious wine which can age and mature. We will also join the winemakers of Chateau Margui, Domaine du Grand Cros and Mirabeau for a wine tasting and lunch as they present their wines and discuss what it’s been like to be outsiders in this very traditional wine region. We will ask them where they see Provencal wine going and how best to market the region. This wine trip will also allow tastings of old and rare varieties. Wines made from varieties like Folle Noir, Braquet and Tibouren are rare, even in Provence. But there is a growing trend in using old varities thanks totheir adaptability to the local climate and their unique Provencal character. Elizabeth Gabay, Master of Wine, allows you to see behind the image of “rosé on the beach” and really discover the history and gastronomic culture of this beautiful region. Hone your palate surrounded by an artist’s palette! This is wine study at its most colorful. Immerse yourself through our Provence wine tour and find out why the stunning French Riviera is one of France’s hottest wine regions!